Along its coast, Algeria enjoys a Mediterranean climate with plentiful precipitation and fertile soils. Roughly 96 percent of the country’s population lives in this mountainous region. To the south, precipitation levels drop, and the land gives way to Saharan sands. Just as the rainfall diminishes, so does the number of human inhabitants, with approximately seven people per square kilometer in southern Algeria. In the arid stretches of southern Algeria lies the Ouargla Oasis. 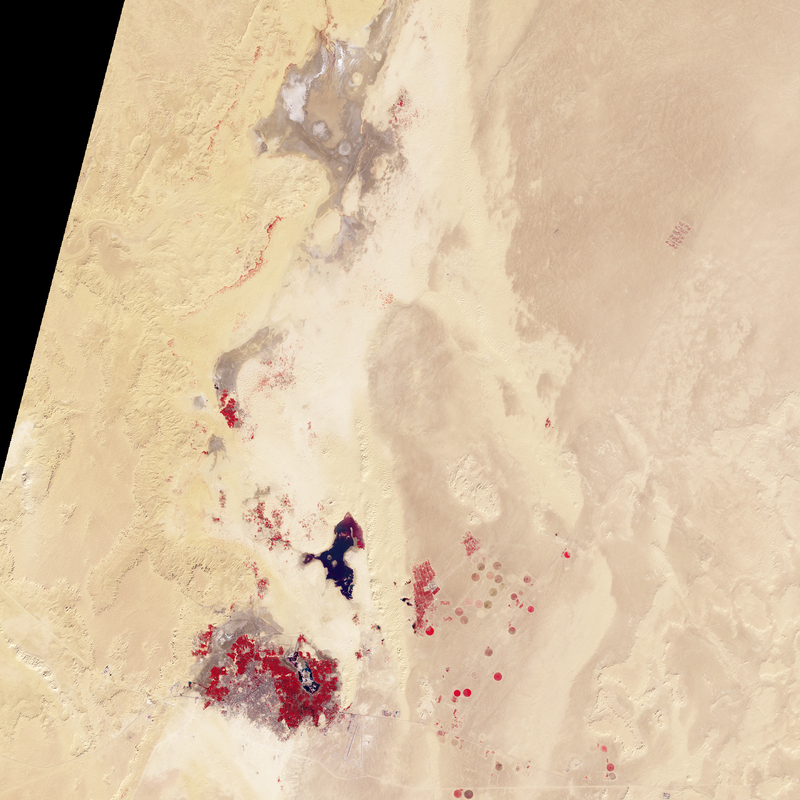 The Multispectral Scanner on NASA’s Landsat-2 satellite captured the top image of the oasis on January 16, 1972, and the Enhanced Thematic Mapper Plus on NASA’s Landsat-7 satellite captured the bottom image on December 20, 2000. In these false-color images, red indicates vegetation, and the brighter the red, the more robust the vegetation. Pale pink and orange tones show the desert landscape of sand and rock outcroppings. The earlier satellite image shows a lush area surrounding the oasis. 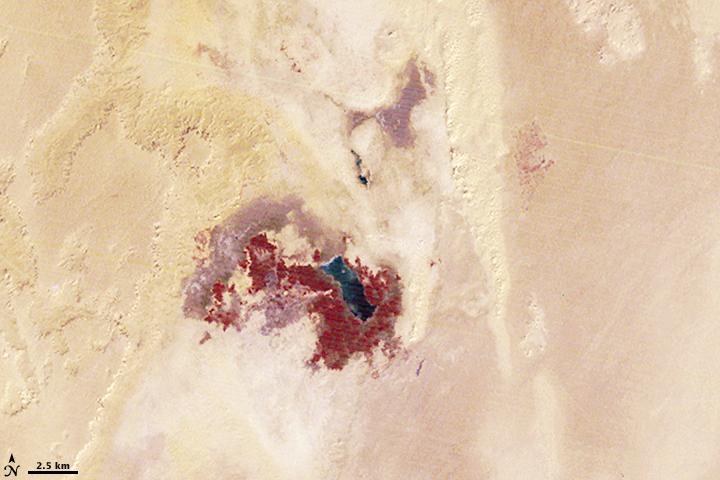 The later image shows both urbanization near the oasis, and an assortment of irrigated fields in the region. 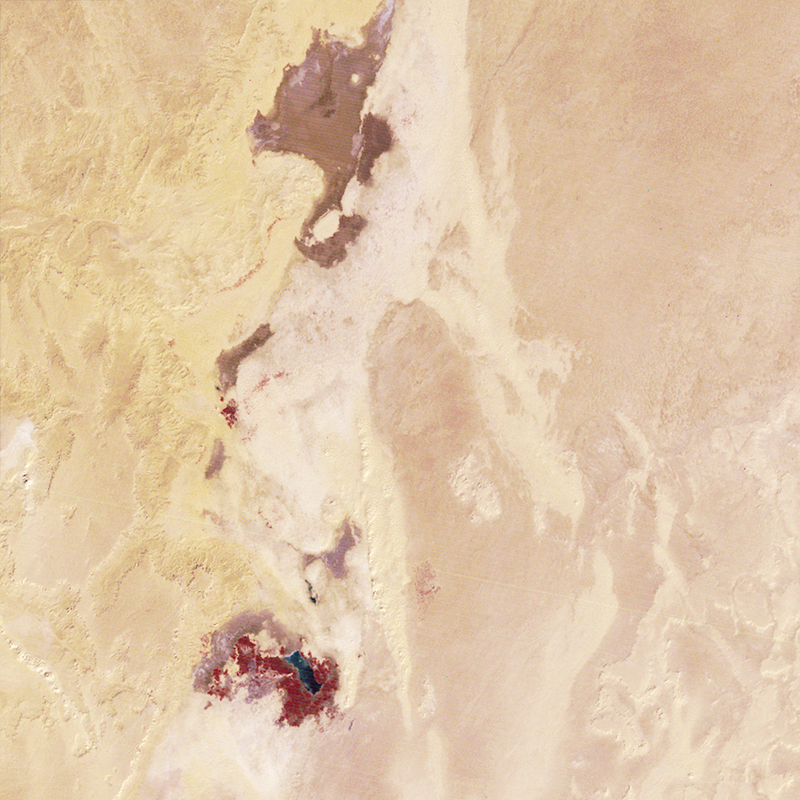 The Ouargla Oasis receives its water from the underlying North-West Sahara Aquifer, a water-bearing rock layer that stretches under Algeria, Tunisia, and Libya. Inhabitants of the Ouargla Oasis have regularly sunk boreholes into the aquifer to tap its resources for irrigation. Beginning late in the twentieth century, however, the rate of well drilling increased to levels deemed unsustainable by the United Nations Environment Programme. Continued drilling was expected to increase the salt content of the upper layer of the water table, which would ultimately harm the irrigated vegetation. NASA images created by Jesse Allen and Rob Simmon, using Landsat data provided by the United States Geological Survey. Caption by Michon Scott. In the arid stretches of southern Algeria lies the Ouargla Oasis. 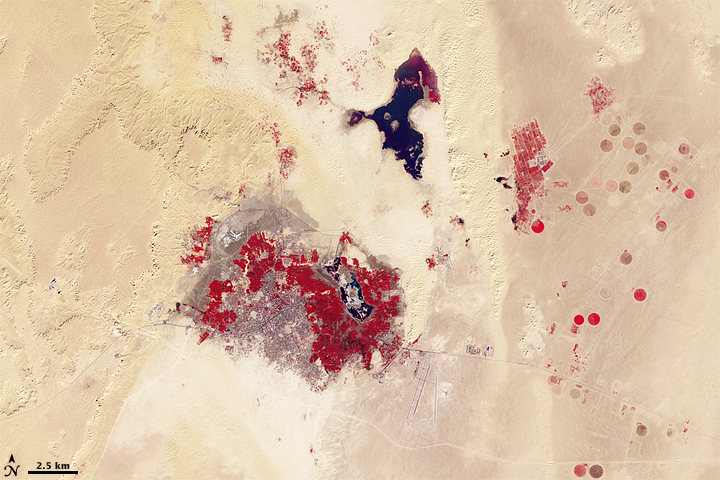 The imagery shows both urbanization near the oasis, and an assortment of irrigated fields in the region.